Should you just stop writing? Is it taking up your time, taking up your energy, taking up your life … and not giving anything back? 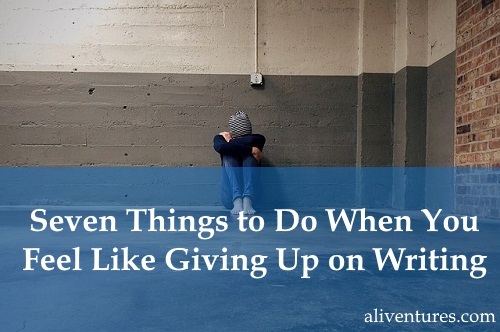 Most writers go through times when they feel like giving up. It’s a normal and natural, if difficult, stage in the writing life. Some writers do give up, of course: either permanently or for a long, long time – perhaps stopping after their college years and not starting again until retirement. And, of course, it might be that you don’t have to write. Maybe you tried your hand at freelance writing but it hasn’t really worked out for you, and you want to pursue something different. Maybe you enjoyed the creative outlet of writing, but you’ve now decided something else suits you better: sketching, perhaps, or composing music. Don’t force yourself to keep on when you’re feeling burned out. Sometimes, simply giving yourself permission to have a break from writing can be enough to get you out of a temporary slump. Take a couple of weeks off, or maybe a full month. You might use your writing time to read, to knit, to craft, to walk … whatever you enjoy. Do you feel like giving up on writing because there are so many other pressure on you? Perhaps you constantly feel behind with everything, and your writing time has to be snatched in the corners of your life. Maybe you’ve taken on too many different responsibilities, and you feel like you can’t manage any of them properly. Handing over a particular role: maybe you’ll step down as secretary of that committee, for instance. Getting help around the house: this could be from your spouse or kids, if they’re able/willing to assist more; alternatively, you could pay for someone to help (even if only occasionally). Going to bed earlier so you can get up 15 minutes early and start your day calmly – rather than having a mad rush every morning to get ready for work. Renegotiating deadlines with clients so you’re not trying to get so many projects finished all at once. Passing on a particular opportunity – even if it sounds like fun, you may simply not have time for it right now. Even if you can only make one small change, do it: sometimes, just feeling a little more in control of your time can make all the difference. If you’ve been writing for a while, go back through some of your past successes. Sometimes, it’s difficult to remember all that you’ve achieved when you’re going through a bit of a crisis of faith with your writing. Pieces you’ve had published in magazines or blogs that you admire. Nice reviews of your novel on Amazon. Lovely testimonials that people have written for you on LinkedIn. A glowing comment on one of your blog posts. If you find it difficult to stay confident and motivated, you might want to print out some of these or save them in a special folder on your computer, so you’ve always got them to hand. Stories / poems that you’ve finished. Drafts that you’ve started, even if you didn’t finish them. Classes or courses that you’ve taken. Work that you’ve submitted to competitions (even if it wasn’t shortlisted). Negative feedback can take a lot of forms: sometimes, it’s simply a lack of positive feedback. Maybe your book isn’t selling, your blog posts aren’t getting any comments, editors never seem to respond to your pitches. We all tend to fixate on the one nasty comment, one bad review, one line of criticism from an editor … it’s just human nature. But it is discouraging, and it’s important to remind yourself this is just one tiny piece of feedback. I find it also helps to remember that the feedback is, often, not really about me. It’s about the person giving it. If someone writes a mean comment on one of my blog posts, chances are, they were simply having a bad day and lashed out at the nearest target. It doesn’t mean I’m a terrible writer. I don’t think you should give up on a goal, unless you’ve genuinely lost interest. Sometimes, though, you might need to review and perhaps modify a particular goal. Maybe you’ve realised that you had some pretty unrealistic expectations (e.g. “I can write my first novel in a month and become a bestseller overnight!) Maybe your goal was a good one, but you need a bit more time, or you need to pursue it in a slightly different way. If you’re struggling to decide whether your goals are realistic or not, check out Are Your Writing Dreams Unrealistic? All of us need a friendly ear (or a friendly shoulder to cry on) once in a while. If you’re feeling really down about your writing, find someone you can talk to. It might be your spouse, a good friend, someone at your writing group, or members of an online group or forum. I know how hard it can be to reach out for help and to tell people you’re struggling – but it can be hugely helpful to share your feelings about writing, and to feel that you’re not alone. Sometimes, you might come to a sticking point in your writing career where you’re not sure what to do next. Perhaps you just can’t get your head around setting up a blog, or you don’t know how to structure a novel, or you’ve tried all sorts of things to market your novel but nothing seems to be working. If this is the case for you, get some practical assistance. Find someone who’s been there before you, and who can show you the path ahead. That might mean joining a group like the Alliance of Independent Authors, who have an invaluably helpful Facebook group full of experienced indie authors. Alternatively, it could mean paying for mentoring, editing, cover design, or another writing-related service. If you’re strapped for cash, blog posts and books can be good sources of help – or you may find a fellow writer who you can swap support with (e.g. they’ll help you set up a blog, you’ll beta-read their manuscript). Whatever you’re facing right now, don’t give up! Do take a break, do reach out for help, and do change your goals if necessary … but don’t stop writing altogether. Thank you so much for your post. It really gives me hope Ms. Ali. I don’t have a plan to abandon writing, but I felt like I was half-paralyzed. I couldn’t describe that feeling before until now. It’s the feeling of loss..that something very precious was taken away from me and my dream was slipping away as well. May you have a very great writing day! Oh Minerva, what an awful thing to happen! So sorry about your flash drive and the loss of all your work. It is so terribly frustrating to lose work like that. But you’ll always have had the experience of having written it, the words you put down, the time you spent … none of that is lost, all of it feeds into your growth as a writer. So glad this post was encouraging for you, and very best of luck rewriting the lost pieces of work. It really gives me hope when a writer says that. Yes, you’re right. The most important and often taken for granted is that growth of a writer. This gives me a really very traumatic experience. So I will back-up my work regularly from now on. Have a wonderful writing day! I really needed this today. There’s so many projects I wish I have finished by now, and so many things going on constantly…I’ve gotten tired of waiting for things to settle. Thank you for this post – just gotta remember that when things finally stabilize, be it a year or a week, I’m still allowed to write. All very good advice. For me, giving up writing falls into two categories: pre and during the self-publication revolution. Giving up writing in the days when you had to have a contract with a publisher to, say, bring up a family was pardonable for years, even decades but giving it up now, when success can come overnight, seems petulant. Thanks, Linda. That’s an interesting take on things. I’ve every sympathy with any writer who wants/needs a break while they’re raising kids (or tackling any other huge challenge!) … though equally, I’d always encourage writers to find the time to write if they want to. This was especially helpful. Thanks. I’ve been in the same place as Minerva, sort of. I didn’t lose nearly as much, but I accidentally deleted three chapters of my current novel. That alone was a huge setback and I couldn’t find inspiration to continue until I just started the book all over again. That triggered a whole series of stops and rewrites from the beginning. My current draft has not gotten nearly as far as I was when I lost those chapters. I must say, this post has restored my confidence. Fantastic writing, as always. Aw, thanks, Emma! So sorry to hear about your novel — ouch! Glad you’re going again, and hopefully the redrafting of these chapters will make later ones all the stronger. Keep at it, and good luck! Thank you—and I actually have spent some time on my novel this weekend. The word count is substantially lower than it originally was, but that’s only because I did away with the alternating perspective format, thus cutting out a whole half of the book. The storyline itself is actually much further along than before, and it’s taken some interesting twists and turns that I didn’t predict. Going strong now! Thanks for this encouraging, helpful, and sensible post, Ali. I’m in querying mode, and rejections are to be expected. None-the-less, they deflate me a little every time. I allow myself a little time to wallow, but no more than a day. Sometimes writing a short story or blog post or submitting to a contest will take the sting away and get me going again. As long as I have stuff out there, I’m still in the game. That’s what really matters. Best of luck to everyone out there. We need each other! Rejections are always painful — but I think you have absolutely the right attitude on limiting the wallowing and carrying on regardless! I find it helps to remind myself that a rejection doesn’t mean anything about the quality of my work, it’s just that my work wasn’t right for one particular editor on one particular day. Best of luck with those stories and blog posts and contest entries! Thank you Ali for this post. I think the most important one here is your first tip: Take a Break from Writing. It is easy to tell ourselves we are writers and we must continue writing every day. Yet moods can impact the way we write and if we are feeling “down” it is arguably best to give writing a miss. I have also drawn the same conclusion about social media posting in some recent content. lighter for a couple weeks while I regain clarity. I think we feel like not writing when we have stopped reading. If we keep reading something, we always have something to write about. This happens with me. We forget that good writers have to be good readers first. Lately, I’ve been practising tiny habits. Doing what I want to do, just a tiny bit of it daily. Like, writing for one minute only, or doing two pushups only, or coding for 5 minutes only. Most of the days, this starts the engine and in no time, I’m doing much more than the tiny bit. Many of us feel a burden when we think “I need to write the 500 word draft,” or “I need to code for this project.” By changing our thought and action to the tiny habit, we do much more. What do you say? Have you ever tried tiny habits? I’ll also advise to join meetup.com and join a writers’ meetup in your area. I did that and love to attend the writers’ meetup. This helps in #6 and #7 above. I’ve found from experience that a lot of this does work. As usual, you’re a genius. Great advice. Thank you for sharing! I needed those points.